I decided to braid my hair on a whim after seeing a picture of Chrisette Michelle with braids in a high bun. I saw the picture on Wednesday night and started my braids that Friday around midnight. Prior to braiding, I deep conditioned with Shea Moisture’s Jamaican Black Castor Oil (JBCO) Strenghten, Grow & Restore Treatment Masque. 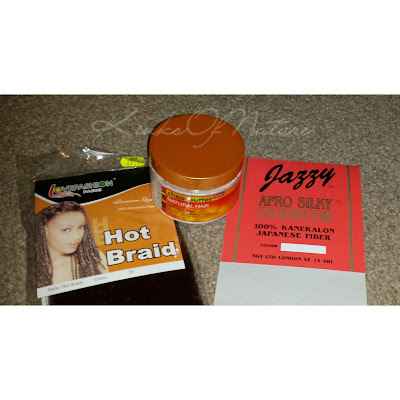 Then applied the JBCO leave-in, sealed with a small amount of Agadir Argan Oil Hair Treatment (review here), and blew my hair out using the tension method. I thoroughly detangled prior to doing so, and again detangled while parting my hair for the braids. Before installing each braid, I trimmed the parted sections. I used two different brands of hair and two different colors: Love Fashion Paris Hot Braid (£1.49) in color 33 for the back and Jazzy Afro Silky (£0.99) in color 340 for the front. I initially bought 6 packs and had to go back for 3 more. I used 8.5 packs total to complete the look. The Jazzy hair was softer, easier to braid with, and sealed relatively quickly. I hated the Love Fashion hair. It was harsher on my knuckles, didn't seal properly, and had an overly shiny finish to the hair. I know people recommend Xpressions, but those were £2-£4. I’d use the Jazzy hair again definitely, but not the Love Fashion hair. Overall, I did love the finished product and blend of colors. Pictures of the finished look are on the Kinks of Nature Instagram page. To make the braiding easier and more gentle on my fingers, I always use a cream instead of gel or wax. I apply it liberally to the synthetic hair before starting each braid. It softens the braiding hair and adds some slip as well as moisturizing my natural hair. This time I used Cantu Shea Butter for Natural Hair Coconut Curling Cream (first impressions here). For maintenance I used Shea Moisture Coconut and Hibiscus Moisture Mist on my hair and Shea Moisture African Black Soap Scalp Elixir on my scalp followed by the Shea Moisture Raw Shea Butter Reconstructive Elixir a few times a week. Normally this is enough for me, but I underestimated how cold it is here and my scalp suffered for it. Next time, I’ll know better. I’m not the quickest braider. Overall it took me about 12 hours, and I braided each one to the end. Next time, I won't be doing that, but I was just afraid they'd unravel before I had a chance to seal them all. Once I take these out, I’m going to give my hair a break for a few weeks, and return to the braids in a couple months before I go on holiday. I’m thinking of going back to black hair, which I haven’t done since 2009, but that’s been in my mind lately so it’s bound to happen soon. I’m just sick of seeing that demarcation line between my roots and lightened ends. A change would be nice.